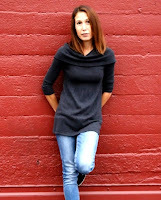 Sarah M. Chen is a familiar name in short fiction circles, but recently, her debut novella, CLEANING UP FINN (All Due Respect) was published. It's a strong debut that introduces Finn Roose, a fun-loving, womanizing, manipulating--yet somehow, likable--restaurant manager whose exploits finally get him into more trouble than he can handle. HW: I really enjoyed CLEANING UP FINN and felt extra special because I got an advanced copy. Will you tell us, briefly, what it’s about? SMC: Thanks, Holly! It’s about a restaurant manager, Finn Roose, who loves the booze and the babes. He takes out a woman on one of his infamous booze cruises and loses her—literally. Then she ends up missing and things go very badly for him from there. HW: On the face of it, your protagonist, Finn Roose, is kind of a jerk. But upon digging deeper, we learn that he’s not such a bad guy and even has some heroic qualities. What is it about this character that made you want to write him? SMC: I’m so happy to hear you say that! There are some who didn’t like Finn and thought he was a real prick. Finn holds a special place in my heart. He’s a mash-up of the people I worked with over the years in the restaurant industry which was a fun crazy time in my life. I wanted to explore a character who, at first glance, seems selfish and shallow, but underneath it all, there’s a reason for why he’s the way he is. People can be quick to judge a work hard/play hard lifestyle, especially if it’s someone who isn’t married or doesn’t have children. It doesn’t automatically mean they’re selfish assholes. Okay, maybe sometimes it does, but not always. HW: Since this is, to a large extent, a blog about writing, will you talk a little bit about how you’ve approached your writing career? Where do you see yourself in a year or five years? SMC: I knew I always wanted to be a writer but it took a long time for me to get started. It’s still taking a long time and I’ve come to accept that’s how I am. I’m not one of those disciplinarians who writes a certain amount each day. I wish I was. I value my downtime. With juggling three jobs, I fit writing in when I can but I make sure to set aside time to read and to travel. It keeps me sane. I honestly have no idea where I’ll be in 5 years. I don’t think long-term like that, although I probably should. I can say that in 1 year I’d like to have a completed first draft of my YA novel. Then again, I said that last year. HW: I like that you work for a private investigator. This seems like it would provide for all sorts of good ideas for stories. Is it? SMC: Yes, it’s a fantastic job for gathering material. Maybe that’s why it’s the one job I’ve held longer than four years. My boss is an insurance adjuster with a private investigator license so almost all of our cases are from insurance companies. We deal mostly with tractor-trailer claims so most of our cases involve cargo thefts and stolen tractor-trailers. My short story “White Devil” in DEATH AND THE DETECTIVE featured an insurance adjuster and it was a lot of fun to write. I also just completed a short story that was based on a crazy stolen cargo claim we just worked on. I’d say more but it’s an anonymous submission and you never know who’s reading what. HW: You’ve been a part of a writing group for a while now. Tell us a little about how your group functions and how you think it’s helped you improve your writing. SMC: I give my writer group credit for everything that I publish. Without Travis Richardson and Stephen Buehler, I’d still be out there flailing around aimlessly. They give me a deadline which is what I need. We meet once a week and we’ve been pretty good about that schedule for the past 5 years which is mind-boggling to me. I normally don’t stick to anything for that long. We bring pages and read them aloud, then provide constructive notes to each other. If we can’t meet for whatever reason, we email each other our pages, but it doesn’t replace the read-aloud aspect which I think is crucial. HW: I know you’re an avid reader. Who are some of your influences and what have you read lately that you’d recommend? 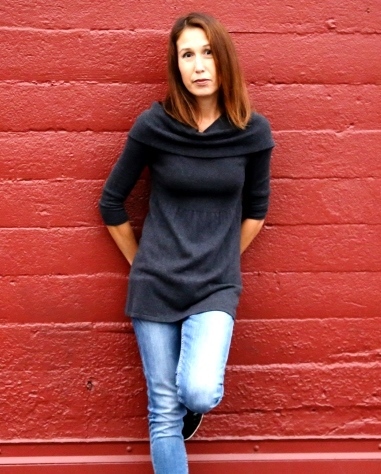 SMC: My love for crime fiction started with Robert B. Parker and Tony Hillerman, but when I picked up an Elmore Leonard novel, I knew I’d found my kindred writer spirit. Over the years, I’ve been inspired by Gillian Flynn’s SHARP OBJECTS, early Dennis Lehane and anything by George Pelecanos. I split my time between crime fiction and YA. Right now, I’m reading an ARC of Stacey Lee’s fantastic YA novel, OUTRUN THE MOON which was released yesterday. It’s a story of a teenage Chinese-American girl in 1906 San Francisco. I also just finished James Ziskin’s HEART OF STONE which I absolutely loved. I’m a huge fan of his Ellie Stone series. Other novels I’d recommend for 2016 would be Lisa Lutz’s thriller THE PASSENGER and Molly Prentiss’s debut TUESDAYS IN 1980 about the art scene in 1980 Soho. 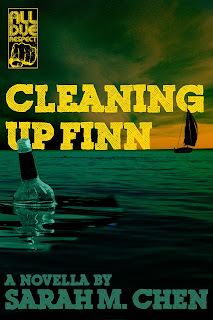 HW: Getting back to CLEANING UP FINN, it’s a novella but now that I’ve finished it, I can see it being a prequel to a full-length novel featuring him. I definitely think Finn deserves a chance to move beyond the world he currently inhabits. What do you think? SMC: Thank you for saying that and someone else said the same thing. FINN actually started as a short story way back in 2007 and I never would have thought of expanding him into a novella so I guess it’s always possible. I do love the character and it’d be interesting to see what he does down the road, but once I’m done with a story, I’m usually done. But hey, you never know, right? Thanks, Sarah, for taking the time to have a chat. Wishing you much success with CLEANING UP FINN! Thanks so much and for the opportunity, Holly. It was a lot of fun! Great interview, Sarah and Holly. I learned a lot about author and book!